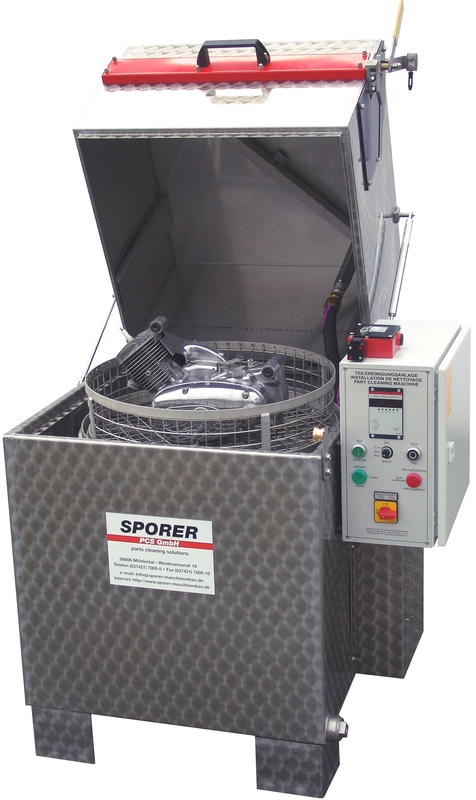 The compact spraying parts cleaning machines... our bestsellers! The Toploaders are conceived for the hard industrial use and an excellent cleaning result. These industrial part cleaning machines fear no cleaning task. 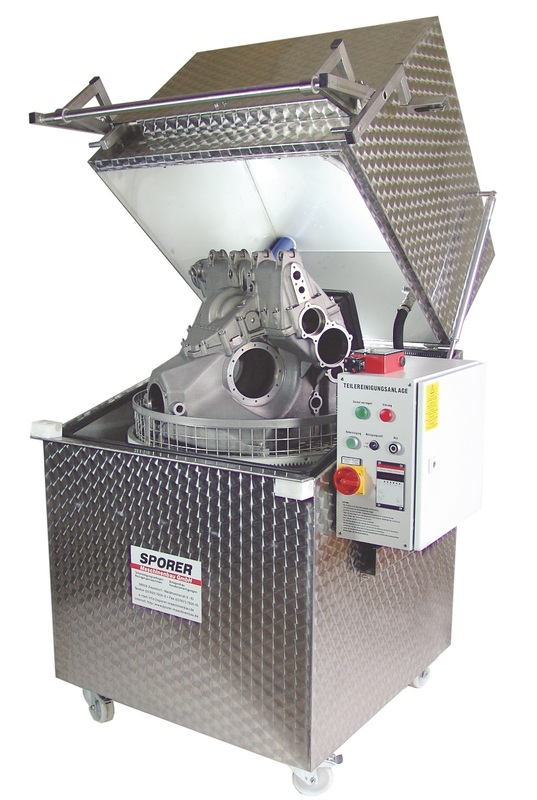 Due to their rugged construction and their comfortable technology, the toploading machines demonstrate their power in cleaning dirty parts thoroughly. They dispose of a high quality standard equipment and due to the aslope body of the machine, the load height is optimal. Based on high-class technology and components, the toploading machines offer a high reliability and machine safety. The cleaning result is dependent on the cleaning agent and the bath care. In standard, the machine is equipped with a coarse and a fine filter. Further care units can optimise the cleaning result (e.g. an oil separator). The industrial toploading machines type TRL are produced serially in big numbers. They convince especially with their rugged construction and their functional composition. Our TRL machines are fully insulated and conceived for alcaline aqueous cleaning agents. Main operation areas are maintenance and cleaning in production. In the toploading machines (fully constructed in stainless steel), cleaning is done by spraying technology. The dirty parts are posed inside the washing basket manually or by crane (optional equipment). The washing process starts after having chosen the temperature and the washing time. The powerful pump with a pump head in stainless steel brings the medium from the tank through the fixed nozzle system to the parts to be cleaned. During this washing process, the round washing basket with the parts inside turns automatically. In this way, the parts are cleaned efficiently from all sides. The worker unloads the cleaned parts directly. With the optional basket change system, the basket can be taken out of the machine and be moved with the help of the transport trolley (optional equipment). Unloading by crane (optional equipment) is also possible. Digital temperature controller "Parts Clean Control"
Our part cleaning machines type TOPFIT are the not-insulated and economic version of the TRL-series with minimal technical differences. They are also conceived for alcaline aqueous cleaning agents. In the toploading machines, cleaning is done by spraying technology. The dirty parts are posed inside the washing basket manually. Close the cover. The washing process can be started after having chosen the temperature and the washing time. The worker unloads the cleaned parts directly. The machine TRA is an economic machine, equipped with 2 tanks. These industrial part cleaning machines offer the possibility to clean parts in 2 processes in a compact mobile machine. The basic construction corresponds to the machine type TRL. The TRA is serially equipped with a full flow filtration. Furthermore, a rinsing process has been integrated, which makes this toploader a 2-tank-machine. The mediums from the washing tank and the rinsing tank are lead in two separate circuits. A seesaw system brings each medium back into its tank. A blowing system and several other optional equipment can be integrated into the machine, too. The parts inside the round washing basket are cleaned by spraying. While the basket rotates, the fixed nozzle system in stainless steel (above, below and on both sides of the basket) clean the parts thoroughly. After the washing process, the rinsing process starts. The rinsing pump in stainless steel brings the rinsing medium from the tank through a separate nozzle system up to the parts inside the basket. A motorized seesaw system guides each medium back into the respectif tank. Washing and rinsing times can be chosen at the programmable controller as well as the heating periods. Both systems are equipped with a full flow filtration. The Topfit-K is our toploader for the operation with solvents with a flash point above 55°C. The dirty parts are posed inside the washing basket manually or by crane (optional equipment). The washing process starts after having chosen the washing time. The pump brings the medium from the tank through the fixed nozzle system to the parts to be cleaned. During this washing process, the round washing basket with the parts inside turns automatically. In this way, the parts are cleaned efficiently from all sides.